How are you this lovely Sunday? Getting ready for school? Work? Luckily (or not), I am preparing for sleeping until noon, as I am still unemployed. 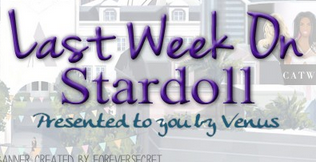 Anyway, how was your week on Stardoll? Did you get your hands on some of the lovely (or not so) items, or you are sad for missing some? In case you missed anything, well, at least you can read about it in this recap. The week started slowly, with the release of new Pretty'n'Love collection. The collection is, well, pretty. I love pastel colors and darker tones, and these items seem just perfect for this season. Textures are well defined too, and there is a variety of items to chose from, either sweaters, dresses, skirts, accessories, etc. I might consider trying to style one or more of the items. The same day, Stardoll opened a new page for Superstar members. 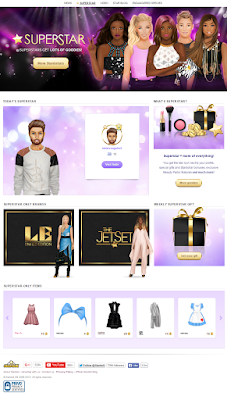 Basically, Stardoll is promoting superstar membership and encouraging users to make a purchase, with a promise of 'exclusive' gifts (things that we can already buy in starplaza - well, at least they aren't starcoin items at least), promoting a random superstar member daily (what about Royalty members? ), and superstar only clothes and stores. I like the idea, really. And not so sound greedy, but I want more. I want sc to sd converter, some daily activities beside the vote and collecting starpoints, and some other stuff (it would take me a lot of time to write them all down/type them). But it is ok so far. I like that at least they gave us that, and I am guessing they are indeed working on more updates. On Wednesday, new Callie's Picks collection - "Inspired by". The collection is basically re-release of the famous (or not so famous) real brand store items. There are so many wanted items, - a nightmare to real collector, but a great chance for people who refused to pay ridiculous amounts of stardollars for the wanted items. Even they are many nice items, I prefer to dress my doll in more 'ordinary', 'punk/goth' eventually, but not that extravagant. Still, I might chose to invest some stardollars in some items, and try styling them. And on Friday, - drumroll please - a new Limited Edition collection!! This collection was like nothing we had before in LE store. Honestly, it seems like it belonged rather to ordinary store. I don't know is it just me, but the items just don't feel like LE to me. They are inspired by nomad style, at least that's how I read. The items remind me of a desert somehow. The fabrics, colors, they are just weird, and not LE. Surprisingly, or rather not, the items haven't sold out yet. I remember the times LE would sell in few hours most, and now some item can stay for even a week or more. It seems to me the quality is going down, either that, or people just refuse to pay that much stardollars for items, limited or not. Few minutes before the release, Stardoll announced a new top up offer. For every top up purchase (not superstar), you will get 15% extra stardollars. The offer is valid until tomorrow, and it is ok for people who frequently by stardollars. But.. but many were disappointed it wasn't released a bit earlier, as they already bought stardollars for LE. For those who didn't, it may be a good idea to invest in this offer, as who knows what we may expect next week, (probably new limited collection, my bet is on SaP). And that's all, folks. A rather nice and exciting week, of course, we can hope next one will be even better, but until then, vote in a poll, leave a nice comment, and see you next week.